"No matter how bad it gets, you are still with us, you are still with us. No matter how weird it feels, feelings are real, we are all just people." 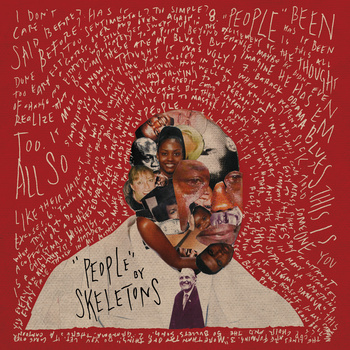 are the first verses slightly gospel sounding on some church organ on the closing title track of Skeletons' last album aptly named "People", and it gets bad, real bad, lyrically, and it gets quite weird indeed, musically. The weirdness of the music is nothing new on Skeletons' already sixth album, released via Shinkoyo/Crammed Discs, the slight surprise comes from the very lyrics-centered particularly social conscious content of the album. Words generally don't attract my attention in music except if the performer especially underlines them one way or the other, and there are no specific rules to achieve this in my book. But there is something in frontman Matthew Mehlan gentle, soft-spoken, near whispered voice which just makes me listen with more attention, just like he would confide his doubts and thoughts and tales right into my ears and into my consciousness. With that closing track, Matthew Mehlan is trying to console the listeners after a serial of grizzly real-life events narrated in the details during the previous songs, but he comes out unconvincing because he's trying to convince himself, repeating a mantra that makes him, and the listener too, feel, yes, consoled. A very human thing to do, "we are all just people". Despite those very realistic and relentless words, the album doesn't sound desperate or dark if at times slightly threatening, not at all, and this thanks already to Matthew Mehlan's sweet parlando voice, slightly reminiscent of more jazz oriented Bob Dorough or Mose Allison, but also through the extremely fluid music and colourful arrangements. Skeletons' music is difficult to define, there's something of progressive rock, but it's as light as a feather; there are moments were they could compete with Battles' or even Don Caballero's virtuosic dexterity, but it's math-rock with a human face; there are afro-beats, near Grateful Dead's improvisations, electronic freak-outs, "Grandma" contains some bridges which wouldn't sound out of place on a King Crimson's album, but it never sounds self-conscious or intentional, it just flows like a wild river carrying all that stuff along. Of all Skeletons' albums (under several monikers like Skeletons and the Girl-Faced Boys, Skeletons and the Kings of All Cities, and Skeleton$), "People" is maybe the best mixed, the sound is spectacular, very textured without losing its delicacy and freshness. Rusty Santos co-mixed the stuff, the guy worked with Animal Collective and Panda Bear but also Owen Pallett, and one could find elements from all those artists there, not as imitations but as influences. While Matthew Mehlan is confiding those terrible stories, the music remains somewhat joyous, energetic, even invigorating à la Animal Collective, like on my fav and almost funky "Grandma", the orchestration finds some bombast à la Owen Pallett, but propelled through the air like a Montgolfiere balloon. So if the record is indeed very lyrics-oriented, this is as far away as one can be from a protest songs album or any verbose spoken-word with musical background, the listener doesn't have to pay attention to the lyrics in order to enjoy "People", the music completely stands on its own, Skeletons being first and foremost one bunch of exceptionally gifted musicians and include at least one ever imaginative and surprisingly melodic composer and lyricist in Matthew Mehlan. A dense, adventurous and musical album with a very human face. Highly recommended, just like the rest of their exceptional discography.